Make drying your vehicle quick, easy, and safe! The Chemical Guys After Wash is a paint moisturizer that will help aid you in a safe drying process! 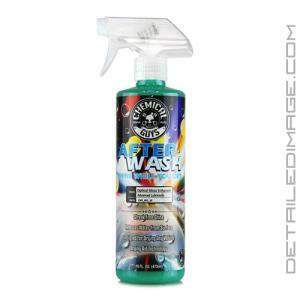 After Wash uses hydrophobic technology to push water away from paint and quickly dry any vehicle. Simply spray onto your wet paint and gently dry the surface with a clean, high quality, drying towel (i.e. DI Microfiber Waffle Weave Drying Towel). The secret to After Wash is the advanced lubrication agents that reduce friction between the paintwork and microfiber drying towel. This allows the towel to glide across the surface, pulling water away safely and easily! The majority of swirls and other imperfections come from poor washing products/techniques and After Wash aids in cutting down the chance of implementing one of these ugly imperfections. Use After Wash on any car, truck, motorcycle, RV, boat, motocross, off road, ATV, or snow vehicle for streak and scratch-free drying! After Wash will enhance any wax or sealant on the surface for increased longevity and it can be used to dry paint, wheels, glass, metal, and plastic surfaces. If you are looking to make drying your vehicle quick, easy, and safe, the Chemical Guys After Wash is for you! Chemical Guys After Wash is an advanced paintwork optical gloss enhancer and moisturizer designed to aid the drying process. The innovative paintwork drying aid provides lubrication when drying any vehicle. After Wash is used after you wash your car to create a streak-free shine when drying the surface. Hydrophobic drying technology aids in drying any surface using a premium microfiber towel. After Wash releases water from the surface for a smooth finish after a wash. The unique spray formula enhances any wax or sealant coating using synthetic polymers for a brilliant shine. The advanced hydrophobic technology forces water away from the surface while allowing microfiber to absorb the maximum amount of moisture. Discover the most effective way to dry any vehicle with Chemical Guys After Wash. While the vehicle is wet, spray Chemical Guys After Wash directly onto the surface to release moisture. 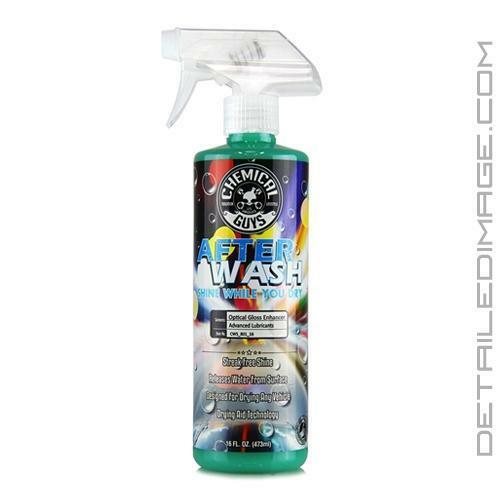 This Afterwash is GREAT especially in the hot weather when your washing the car and it starts drying before you can finish wiping it down with a microfiber towel. I just spray it on the towel then spray it on the area I'm drying and it removes any water spots that may have formed and also prevents scratching that can occur when drying. Plus it leaves a nice protective shine on the whole vehicle even the plastic trim. Highly recommend this product, you can't go wrong. Great product. Really helps dry the car and allows for a deep gloss that is enhanced by a polymer spray afterwards. Use it on dark cars and the color is very deep and the light cars look wet. Will definitely buy again.